Your post has been removed to a secure, hidden area for violating Forum Guidelines [circumventing the language filter]. If you are not familiar with the Guidelines you may review them here. Why did Xfinity/Comcast take off the local weather channel (weatherscan)? I used it all the time. The local weather channel (weatherscan) was taken off and replaced with the National Weather Channel. Why? I used it all the time to look at the radar and see what the temp and weather was. Now, I have to wait until it comes around to the Springfield area. We have the triple play, all channels and we also will not be seeing weatherscan as of Oct, 10th. Really close to getting rid of comcast. I posted a survey dated January 10, 2017, by Wall St. 24/7, which found that Comcast was the most hated company in America and why. There was no profane language used or anything else which would draw the attention of the Comcast Censor bot. For some reason that post has now disappeared from this thread. Perhaps ComcastTeds knows the answer? The reference to that survey was found on Comcast's own xfinity meet and greet webpage... go figure? Hi alan15, this issue has already been addressed by (ComcastTeds). Please review the information below. Thanks for your continued and valuable feedback. It has been noted and shared directly with our local and national programming teams that were involved with this decision. We regularly examine our programs and channels in an effort to bring our customers the best overall entertainment choices and the content they want the most. As a result, Comcast must sometimes remove channels that have lower viewership to make space for higher valued, more popular channels and to keep our channel line-ups consistent across markets. The Weather Channel is still available (channel 40 in your area and in HD on channel 1102) and provides localized weather every ten minutes on Local on the 8's. We have also launched a localized HD Weather Channel feed across most all markets. There is a localized weather app available to customers on our X1 platform. Press the XFINITY button, choose the gear icon on the right, scroll to Daily Life and then select Weather. Or just say "What's the weather?" into the Comcast voice remote control to see an extended forecast local to your zip code anytime from The Weather Channel. Customers with our traditional on-screen program guide also have access to local updated weather forecasts via the guide's Main Menu, then select Local Weather. We have also found that most of our customers access this information through their mobile devices and the Internet. Your local broadcast TV stations (WHNT, WAAY, WZDX and WAFF) will continue to keep you updated as to ongoing and breaking weather coverage. Dear alan15, it sounds like you still have access to the WeatherScan channel in your area. Comcast snatched that channel away from most of us a few years ago. Appreciate the WeatherScan channel while you can still receive it... because when it's gone, it's gone! ComcastAmir mentioned that ComcastTeds had posted a response many years ago which was entirely unsatisfactory then as it is now. Also, follow the responses from this Forum to ComcastTeds solution, and then, checkout the other forums on the WeatherScan channel 'gone missing' issue and you will find that Comcast doesn't care about what it's customers value as useful programming. Finally, 'Google' the Wall St. 24/7 survey 'Customer Service Hall of Shame' to see why Comcast doesn't care about their customers. BRING BACK THE WEATHERSCAN CHANNEL!!! Please Note: By having an account and utilizing these forums, you have hereby agreed to the rules, policies, and guidelines contained within this document as well as any other posted documents throughout the community. The Comcast Help & Support Forums are subject to the Subscriber Agreement at http://www.comcast.net/terms/subscriber and the Acceptable Use Policy at http://www.comcast.net/terms/use. The use of 'remove', 'removal' or 'removed' may be substituted for 'edited' or 'deleted' at anytime. Comcast forum "official employees", "moderators" or "administrators" reserve the right to remove any post and/or topic that we deem inappropriate or disruptive to the Comcast Help Forums Community. These Guidelines Can Change Without Notification. To make sure this Post is not "off-topic" - BRING BACK THE WEATHERSCAN CHANNEL!!! The Weatherscan channel was a very valuable and useful feature offered by Comcast/Xfinity to many of Comcast's subscribers, as evident by the number Comcast's subscribers complaining about its removal in this thread! Comcast's resolution to this problem has been to suggest using The Weather Channel, or over the air local news channel's online web services. This is entirely unsatisfactory, since the Weather Channel has become a bloated and over commercialized Comcast channel and therefore a useless and ineffective channel! Local channels are fine if you receive them, but if one subscribes to Comcast cable services because of ones local over the air reception issues, then one is out of luck and paying for it through the nose! It would not be surprising to Yours truly, that all of these Comcast Weatherscan forums are an effort to capture or circumvent these Comcast complaint threads about the loss of the Weatherscan channel so that they do not leak on to Twitter of Facebook. If so, good luck with that. By the way, just because ComcastTeds gets to decide what is off-topic and what is not of off-topic doesn't mean Yours truly doesn't keep a pre-post copy of these threads anyway. We understand your (and others') passion and desire around this channel. Thanks for your feedback, it has certainly been heard and shared. For the record, I did not remove your post. It was removed by another employee or Forum Moderator/Expert based on our forum guidelines. Also being removed on Garden State, NJ system on Nov. 6th. Love Weatherscan (ch 101). Been around since we had first had Digital Cable from Comcast. Your post has been removed to a secure, hidden area for violating Forum Guidelines [creative bypass of the language filters]. If you are not familiar with the Guidelines you may review them here. ""We regularly examine our programs and channels in an effort to bring our customers the best overall entertainment choices and the content they want the most. "" I would love to know how comcast accomplishes this. I've never been asked. Does comcast track the channels we watch? It seems, from the posts in this forum, that your customers WANT the weather scan channel to stay; is this meaningless to comcast? How much does it cost comcast to show this channel? Would love to know this, also. So, if you really want to know what this customer wants, I want this channel to stay. If I can suggest an (even better, in my opinion) alternative -- we have a weather channel on Ch. 249 (WFMZW) that my husband and I are now using almost full-time. See if you have that one. It's out of the Allentown/Easton, PA area, but the maps and forecast info cover a good bit of the area in which we live. Also covers down the shore. It carries watch and warning notifications that are specific (not like Weatherscan's vague "A severe thunderstorm warning has been issued for a portion of the viewing area" -- WHAT PORTION??) and are issued for as far down as the Jersey Shore, most of Delaware, and parts of Maryland and the Philly area as well. Truly, we like it way better than Weatherscan; better than The Weather Channel, too. As long as Comcast doesn't screw up and take WFMZW away from us, we feel well-covered, forecast-wise. If you have this one, give it a try. Just a thought, but if everyone who posted here would contact their u.s. representative, they might? be able to put some pressure on comcast. comcast, it seems, doesn't seem to care about how many complaints it gets on this foruml. It does seem weird to remove it, since my understanding is that Weatherscan is a Weather Channel/Comcast (or XFinity) collaboration. Your suggestion is a good one, but I doubt that it would do much good. There have been other channels that were of public service (including public safety) to particular areas of the country that Comcast decided to delete. Public hearings, petitions, protests (including from local and state lawmakers) made no difference. In one case, the channel was #1 in that area in terms of viewership -- but Comcast stated that the channel didn't fit its "urban" image (and this wasn't an "urban" area, by the way). And if customers wanted to keep that channel, they were welcome to change their TV service to other providers who carry it (Isn't that nice? You have their permission to spend your money elsewhere.). "f I can suggest an (even better, in my opinion) alternative -- we have a weather channel on Ch. 249 (WFMZW) that my husband and I are now using almost full-time"
yes, I have that channel also, but they show too much that isn't of interest. my biggest complaint, is that weather scan is the only channel (I know of) that changes its' programming to accomodate severe weather in the area. It shows the radar and storm warnings MUCH more often, cycling maybe once per minute, which is exactly what I want--and I might add-- the weather channel and other apps ( what the moderator suggested using)--DOES NOT. For me, the radar is the most important thing to see. so, you could say that removing this channel is against public interest in the ability to get severe weather info in real-time at the local level. Apparently I've been blocked from this thread by Comcast's Forum/Moderator Expert by pointing out exactly what you say for the last few years. It seems that I can't even post a Kudos on your behalf these days. We used the live Doppler radar, provided by the WEATHERSCAN channel when it was available, to track many dangerous hail storms in our area... always a good idea to get your auto inside when 1-inch size hail stones are approaching. Unfortunately, Comcast doesn't care that the WEATHERSCAN channel is is an important community service to all of us who use it and miss it. PS: BRING BACK THE WEATHERSCAN CHANNEL!!! We are very disappointed to read in our bill that Weatherscan will no longer be available after Nov. 7. This channel is very convenient and we probably watch this channel more often than any other, although for short periods of time. Comcast is now less valuable to us as a consumer. Weather Channel spends a lot of time on other topics, such as tornadoes that happened years ago. Now I found out that in the DC-MD-VA area -- the Nation's Capital -- Weatherscan is also being abolished as of Nov. 7 -- in tandme with a hike in Comcast bills here. Because of Congress, I never thought Comcast would have done this here in their backyard. But THEY JUST DON'T CARE (or pay off enough Senators and Reps not to need to). As everyone else has noted, non-stop radar has always been a real advantage in adverse weather, but Comcast doesn't think their have any responsibility to the people who pay their constantly escalating bills. Hello HULU, Amazon, Netflix etc via other internet providers. This is a deal breaker - No Weatherscan, no customer. My search for a new provider begins today. Weatherscan was the ONLY reason I stuck with Comcast so long because no one else had it. My whole family (in multiple households) uses it. Now that Weatherscan is gone, there is no reason to stay with Comcast as I know there are cheaper options. You guys act like the Weather Channel is so great but when their prime time programming is on they don't break in to show our local weather. Weatherscan was available all the time. This is a good illustration of how the concentration of media ownership sooner or later is a DIS-service to the public: Comcast owns the Weather Channel so there is no cost to favoring them over other weather alternatives. And I agree, the Weather Channel is largely entertainment unless it's a major weather disaster that will drive short-term ratings. I bet Comcast's numbers showed that people spent a lot more time on the Weather Channel than WeatherScan. What they failed to comprehend was that was because on the Weather Channel people were forced to stay a long time for the "8's" for the local weather to be shown. On WeatherScan they only had to wait a minute or two for the local weather. An earlier post by a Comcast employee said that people get their weather information from other sources such moblile weather apps. That is another example is what happens when they don't serve their customers. As times go on more and more customers will leave when they are better served elsewhere for more important things like programming. Where did Weather Scan (channell 116) go? It was there yesterday, 10/10/17. Why are you discontinuing the weatherscan channel?? Its one of the best you offer..
Much better than the weather channel for local weather. Re think please. Really? What area of the country do you live in? I apologize for all the incoveince. Comcast continuously evaluates the content that we deliver to our customers. As part of this ongoing evaluation, we decided to discontinue offering the Weatherscan channel for all our customers this year. I can't find the Weatherscan Channel. Where is it? I apologize for any inconvenience. Weatherscan is no longer available. Will you bring Weatherscan back again? Comcast has no current plans to offer the channel again in the near future. Is Comcast offering anything in place of Weatherscan? Please check your channel lineup for local weather channel options. What will happen to my scheduled DVR recordings? We will drop the Weatherscan channel in your area and your DVR will no longer record any new or future programming on the Weatherscan channel. At that time, the channel will not be available to watch. The Weather Channel is still available and provides localized weather every ten minutes on Local on the 8's. There is a localized weather app available to customers with the X1 platform. 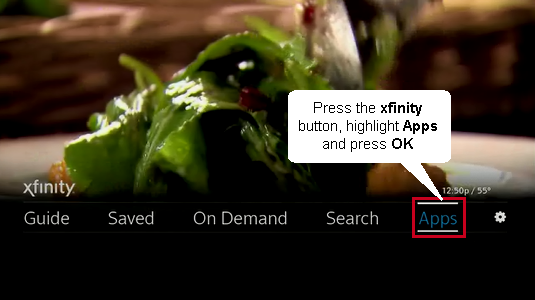 Press the xfinity button on your remote control. Using the arrow buttons, highlight Apps and press OK. Using the arrow buttons, highlight Weather and press OK. Here you can view your current forecast, or scroll to highlight Extended Forecast. Press the OK button to view the extended forecast. Using the left arrow and right arrow buttons, highlight a specific day of the week for more weather details. From the Extended Forecast, select Last to return to the main Weather app screen. Press Exit to return to standard TV viewing, or press Last to return to the Apps menu. Cannot even grasp the incongruity in his corporate-speak reply: "Comcast continuously evaluates the content that we deliver to our customers....Comcast has no current plans to offer the channel again in the near future." I also viewed this channel multiple times per day every day! Please bring it back! Please get back local Weather! I wholeheartedly agree with you on this! I hope they aren't getting rid of it! It states to look at the weather channel or local channel! TWC doesn't always show local weather! The weather scan was so convenient! I think they might care if enough people make their opinions known that they want it brought back! You can submit a Customer Feedback Form to let them know how you feel. Very disappointed the Weatherscan channel is no longer available. One of the main reasons we have stayed with Comcast this long. Have been a customer for approx 22 years. Please reconsider adding it back. If not, then time to start looking for a cheaper alternative. I too have seen it dissapear. This channel is a staple In our home. Where did it go?!?!? What happened to channel 116? We watch it every day!! The Weatherscan Local channel has been available in my area ever since I moved here over 7 years ago. I've often put it on when The Weather Channel was showing its original programming or devoting its coverage to a hurricane, winter storm, or other severe weather somewhere else. At those times, Weatherscan was very handy because it always showed the local radar and other information, which TWC often doesn't do during those times. I especially liked Weatherscan's availability when we were having severe weather here, because it would suspend the usual looping of information and show just the local radar. This made it possible for us to monitor the severe weather. I just tried to go to Weatherscan, and it's showing a notice to tune to TWC or local broadcaster for information, instead of showing the weather information. I can't begin to tell you how angry this makes me. It might seem like a trivial thing to Comcast/xfinity. But, to be honest, the availability of Weatherscan has been one of the reasons I've stayed with Comcast/xfinity for these 7 years, because of the reasons I've given above. My apartment complex has a deal with AT&T and I've resisted switching to it so far, in spite of issues I've had with Comcast/xfinity. But the dropping of Weatherscan Local here might just give me the reason for changing. This was a bad move, even if the majority of customers don't care about it! I continuously evaluate the content that that is delivered to my family. As part of this ongoing evaluation, I have decided to begin a search for more cost efficient savings on the content I desire beginning on October 10. Tell management that I'll be looking at alternatives to Comcast for TV. I payed for that channel until 10/28/2017. What do they have to say about not delivering what was paid for? "Tune to the Weather Channel or your local broadcaster for local and national weather information." I used it for radar extensively (as a motorcycle rider it was very helpful to determine if I could ride where I needed to go). And I liked the music...my wife made fun of me I'd leave it on so much. Agree with you. Bad mistake for Comcast. We had some severe storms moving thru our area last night and went to the Weatherscan channel to check out the radar. To our surprise--- nothing there but notice to go to Weather Channel. Luckily, we were able to check out the radar using a weather app on the phone. Please put the Weatherscan back. I apologize for all the incoveince. Comcast continuously evaluates the content that we deliver to our customers. As part of this ongoing evaluation, we decided to discontinue offering the Weatherscan channel for all our customers beginning on October 10. Starting on 10/10/2017 at 12:01 AM, we will drop the Weatherscan channel in your area and your DVR will no longer record any new or future programming on the Weatherscan channel. At that time, the channel will not be available to watch. Our September 2017 bill said the same thing, "Channel Lineup Update: On October 10, 2017, Weatherscan will no longer be available as part of your Xfinity service." Apparently our local office in Huntsville, AL did not get the memo. As of 7:00am on October 11 the Weatherscan channel is still being broadcast. I am watching it right now. WHY, best way to get local weather in a storm, been there forever,weather channel don't help for that,many people mI know depend on it, for kids to school, storms. of all the channels you pic this( what to save a buck). probably the one channel that most everybody uses. We noticed it being gone yesterday morning. As we often have it on D in the mornings while family is getting ready for school/work. Such a crappy thing for Comcast to do! I agree. I work outdoors and relied on Weatherscan over the local news and other outlets. Thanks a lot Comcast. I can’t even begin to understand the elimination of the Weather Scan Channel. One of the only reasons I have the TV package I have, was because of the Weather Scan Channel. Those of us that need to see the radar when we need to, relay on this channel. Since the Weather Channel does not always carry live programming, it is not a reliable option. We rely on the Weather Scan Channel. If you get up at 3:30am like I do it’s your only source for up to the minute weather. How does Comcast improve service to it's customers by saying "Comcast continuously evaluates the content that we deliver to our customers. As part of this ongoing evaluation, we decided to discontinue offering the Weatherscan channel for all our customers beginning on October 10"
It’s pretty sad that as our cable bill goes up, what we get for our money goes down. There are different dates for different areas. For Huntsville, the date for the drop of this channel has been pushed out to December 5, 2017.
i would like to know why you discontinued the weather channel on channel 101. I want a reason. I am VERY upset as I am sure many other customers are so I would like the reason and I would also like you to bring it back!!!!! !